We have been working Stratford Parks for over 7 years now. Building an excellent relationship with our clients is extremely important to us. In doing so we are able to fully understand the needs of our clients so that we can work together on projects to ensure the print work they have really works for them. Following a recent re-brand, we worked closely with Stratford Parks to understand exactly what they wanted to achieve through the new printed items they were looking at ordering. We always offer clear and honest advice when working on potential projects, not afraid to ask difficult questions and not afraid to think outside the box in regard to finding solutions that will mean any money spent on printing is money well spent. Stratford Parks regularly exhibit at caravan and camping shows, so for these we printed a whole range of items including embossed wallets, die-cut folders, loyalty cards, referral cards, business cards, note pads, pens, carrier bags, banners, flags and bunting, fold-out leaflets, brochures, special offer leaflets, flyers, letter headings and window stickers! 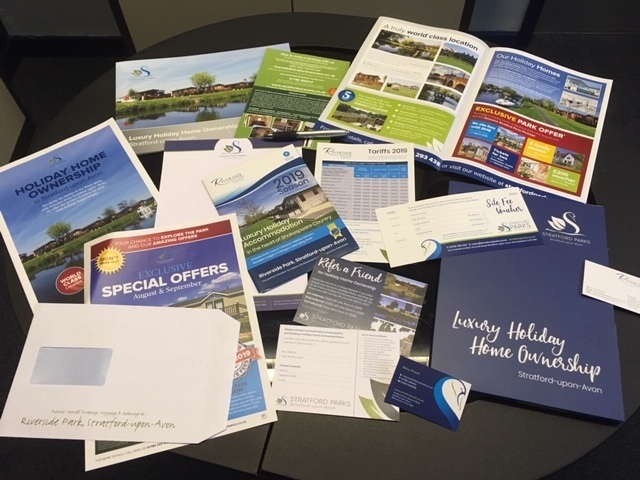 The consistency and quality of the print we have produced has helped them engage in a positive, enthusiastic and proud way with their potential clients. Their clients feel special, and that’s what great printing should achieve.